On this Memorial Day 2015, Scared Monkeys sends a special thank you to all of the military men, woman and their families who have sacrificed their lives to that We, the United States of America, remain the home of the free because of the brave. We thank from the bottom of our hearts those who we can no longer thank in person for their sacrifice to this great Country. Thank you and God Bless you, we shall never forget you your service and sacrifice. Please take time today to remember what this day is truly about and the men and women that we have lost. 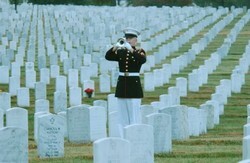 A thank you to all that made the greatest sacrifice for us. May we honor your sacrifices and make you proud. I think your Uncle Red is very proud, Red. Thank you and your family for his service, and your sacrifice. Muffy How are you and your family holding up. Prayers for everyone in all the states that are getting slammed with the rain. Our local weather men are saying another 3 weeks of rain. I think the only place in Texas that isn't getting rain is El Paso. This call goes out to all Texas monkeys-----My thoughts and prayers are with all of you in Texas. The flooding there reminds me of the flooding Nashville, TN received a couple years ago. Stay safe, keep dry (if you can), and I send my prayers to all of you affected by this. If the weather channel is right. Today should be the last day of rain here in Texas & Oklahoma for awhile. If their math is right about the amount of rain here. There was enough rain that fail that the whole state of Texas could have 8 inches of water on the ground. That's the whole state. That's a lot of rain. I know Muffy. But today is a dry day. Praying the searchers find the rest of the missing people soon. So many have been impacted by all the rain this month. Tell us something we don't already know ... Study Says Chimps have mental skills to cook. Why else would Monkeys come up with a cookbook? They're not likely to start barbecuing in the rainforest, but chimpanzees can understand the concept of cooking and are willing to postpone eating raw food, even carrying food some distance to cook it rather than eat immediately, scientists reported on Tuesday. They do lack the ability to produce fire. But if they were given a source of heat, chimps "might be quite able to manipulate (it) to cook," said developmental psychologist Felix Warneken of Harvard University, who conducted the study with Alexandra Rosati. Whilst the finding may seem esoteric, it lends support to the idea that cooking accelerated human evolution. Cooked food is easier to digest, spurring the growth of large brains in our australopithecine ancestors, Harvard's Richard Wrangham proposed about a decade ago. 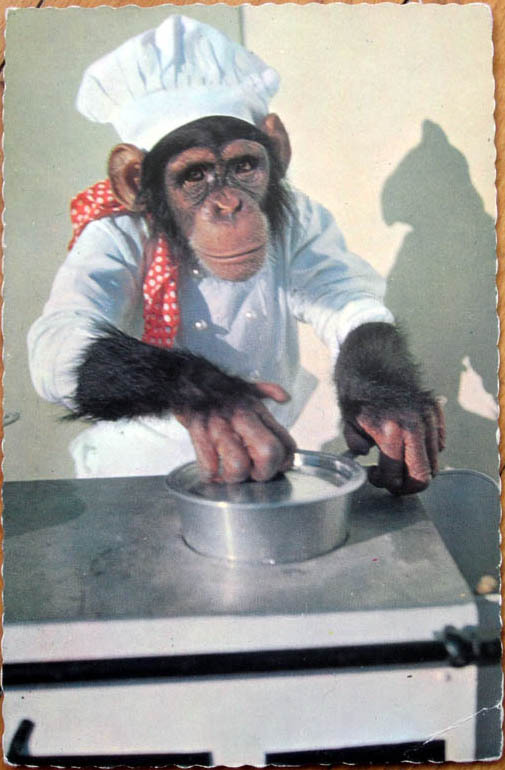 If chimps have the cognitive skills to cook, australopithecines likely did, too, said Wrangham, who was not involved in the study: "It suggests that with a little extra brainpower, australopithecines could indeed have found a way to use fire to cook food." me confused -- I thought eating raw veggies, etc. was better for me. Me going to rainforest and learn from monkeys! I hope all the Monkeys & their families are doing well, and everyone made it thru all the bad weather. Hoping to be able to have youngest grandson spend some time with us this summer. So proud of my second oldest granddaughter in California. She is going back to Haiti on her second missionary trip. She has blossomed into a loving caring young lady. So glad to see your update, Mere! I knew you'd do great! Hopefully your stamina will improve with more time too. I just knew you'd get an A+! You are an over achiever for sure! You'll have your stamina back to 100% in no time at all. You must be doing good if you are thinking about a road trip. Glad to hear your daughter and son in law are doing good on their trip to Texas. The weather has been scary for the midwest! You have to be so proud of your granddaughter, she sounds like a wonderful young woman! Mere what wonderful news about your knee. I am sure you will get your strength back in time. Granddaughter was happy she didn't have to have any shots this time. Last year she felt like a pincushion. Grandson lives in the next town over from us. I love having him here as he keeps me motivated. I am proud of her. The difference in her personality after going last year has been wonderful to watch her grow. Going from a shy teen that hardly ever talked. To one that is out going and loves to be around children. Page created in 7.234 seconds with 19 queries.